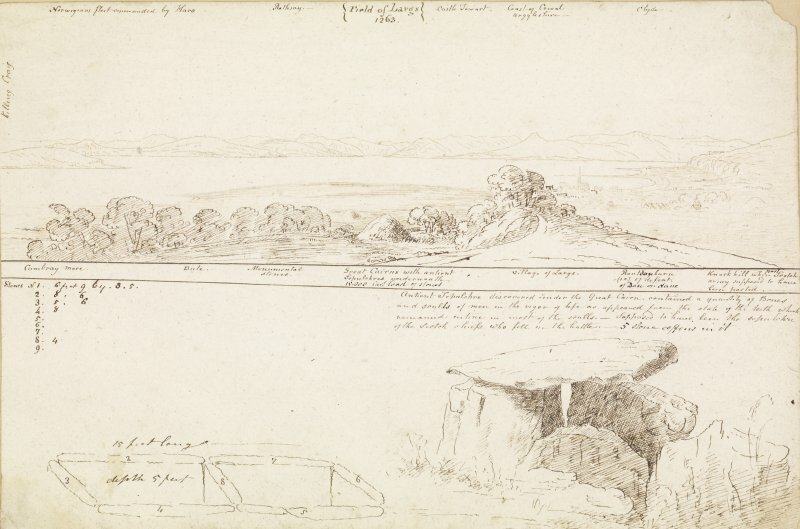 Digital copy of annotated drawings of cairn: panorama of surrounding landscape; detailed drawing of the cairn and chamber. James Skene album, page 70. Annotated drawings of cairn. 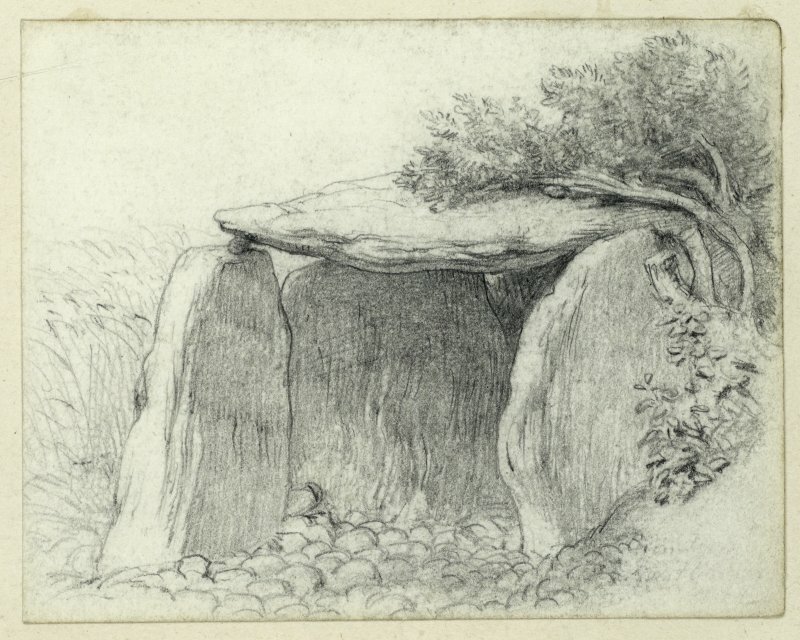 One shows the cairn in the surrounding landscape, the other is a detailed drawing of the cairn itself. 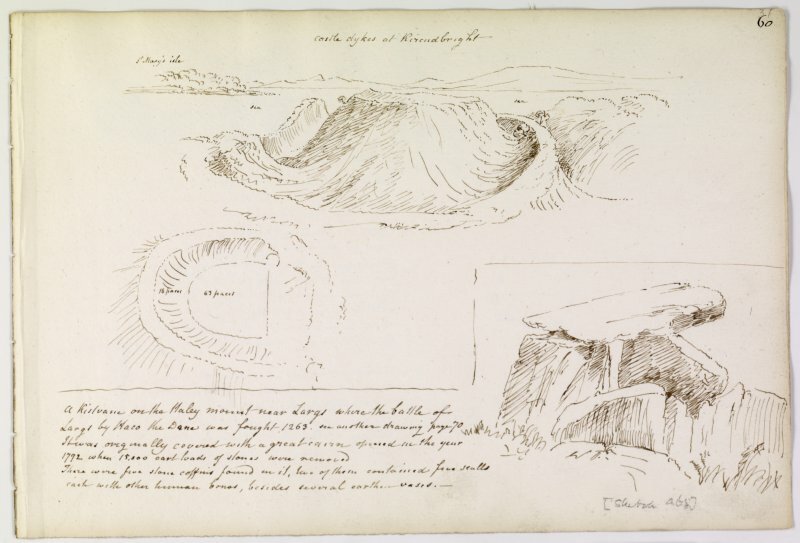 There is also a sketch plan of the cairn. From album, page 70. Digital image of AYD/194/1/P. 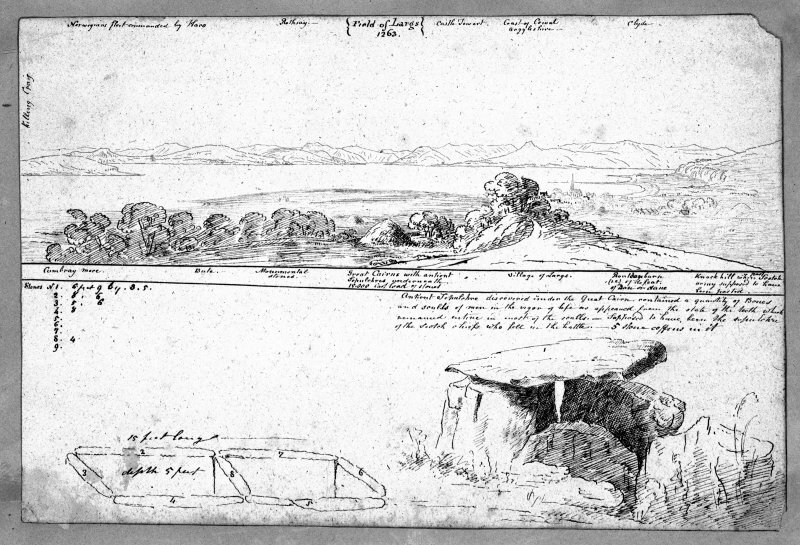 Annotated drawing of cairn from album, page 60. Digital image of AYD/194/2/P. Location formerly entered as NS 2094 5858. 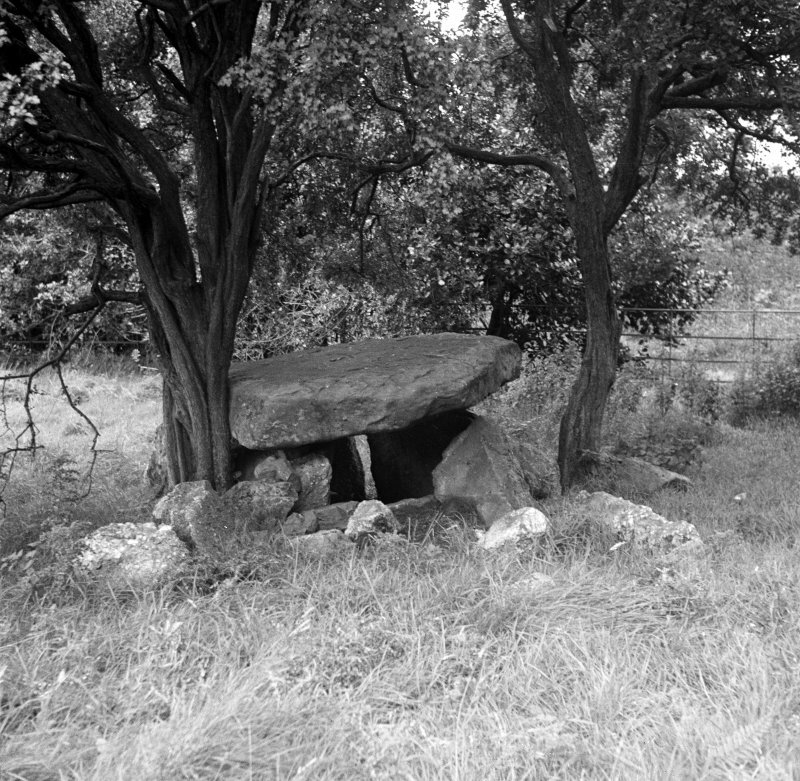 This burial chamber, also called 'Haco's Tomb', lies in pasture, on a gentle slope, between 100ft and 150ft OD. It was covered by a large cairn, "Margaret's Law', which was completely removed in 1772. 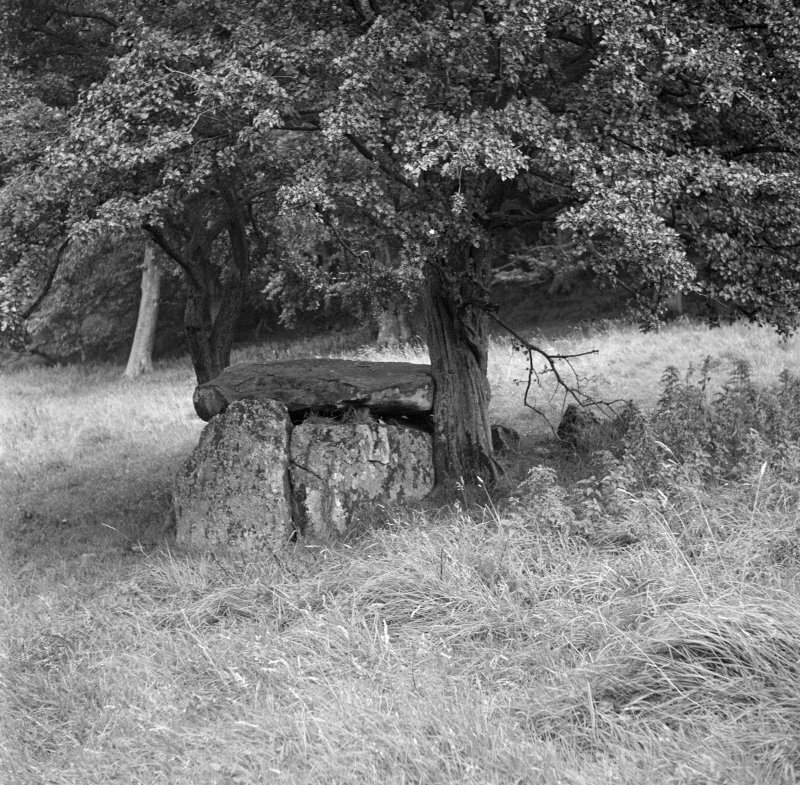 The Clyde type chamber, with entrance to the E, measures 22ft by 3ft - 4ft wide, it probably had three compartments, but only the innermost remains intact, complete with capstone. It is said that in 1772 two of the compartments contained five skulls each, while during excavations in 1954 parts of two skulls and other bones were found. A flint knife or scraper from here is in private possession. A broken, brown earthen urn (OSA 1796) or several earthen urns were also found in the chamber in 1772. This burial chamber is as described. Visited by OS (WDJ), 27 October 1964. No change. The limits of the chamber are fenced off from the paddock field in which it is situated. A private notice board names it 'Haylie Chambered Tomb'. Visited by OS (JRL), 2 January 1983. Monument Scheme worked with local volunteers, the Largs and District Museum and Historical Society and the North Ayrshire District Ranger Service, 4–5 July 2015. The work aimed to raise awareness of the existence of the cairn, undertook sensitive vegetation clearance and provided training in photogrammetry with the aim of building capacity in the area for future heritage volunteer projects and longer term understanding and management of the site. GPS. Interpreted detail was surveyed in the field using the Trimble S6 total station, on the same grid as the control survey, allowing interpretation to be overlain on the laser scan data. 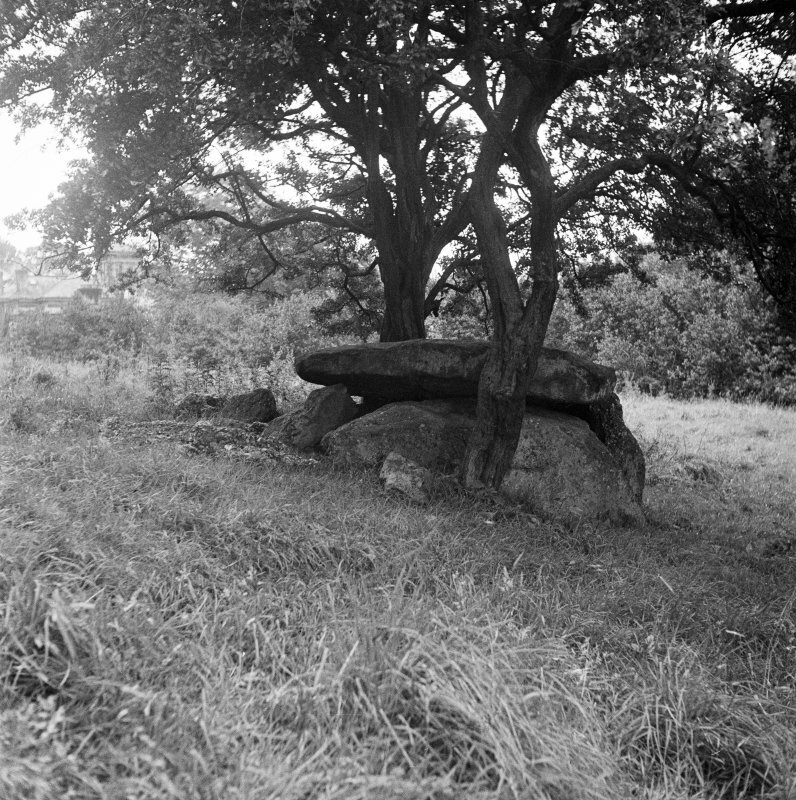 The Clyde type chamber of Haco’s Tomb lies on a broad terrace of the general W-facing slope above the town of Largs in a clearing in scrubby woodland with housing to the immediate W.
from antiquarian excavations. No trace of the extent of the cairn can now be identified, however the statistical account reports that a huge cairn known as St Margerets Law was removed in 1772, exposing the chamber visible today. A reputed 15,000 cart-loads of rubble were removed from the cairn.